Vasantha House, Survey No 79, Hafeezpet, Serilingampally Mandal, Hyderabad - 500049, Andhra Pradesh, India. Vasanta Estates (now, Vasantha Group) was established in 1996 to cater to changing perceptions of lifestyle in Hyderabad. Promoted by Sri Vasantha Venkata Krishna Prasad, a young entrepreneur, the company focused on elite clientele and built apartment buildings and gated communities of villas to uncompromising standards in strategic locations of Madhapur, Kondapur and Gachibowli. The promoters incorporated innovative designs, latest trends loaded with desirable amenities to give unrivalled value to the customers. Professionally managed and executed,Vasantha City" a mega project both in scale and quality, will be the crest jewel among their ventures. Choosing a home is a cherished dream and an onerous job. You look for the best value in terms of location, lifestyle, quality and investment. We at Sri Vasantha Estates, now Vasantha Group are committed to fulfill your aspirations over the past fifteen years. With rich experience in construction, we have delivered supreme value through upscale gated communities and apartment projects in Madhapur, Kondapur and Gachibowli. 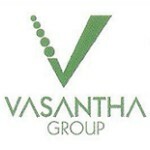 On behalf of Vasantha Group, I welcome you to the world of quality lifestyle in our latest venture, "Vasantha City".